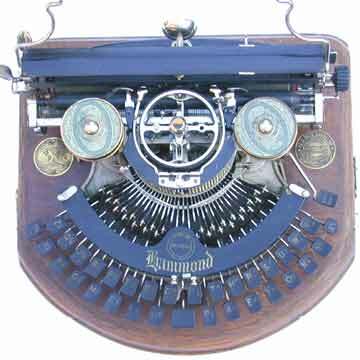 In 1913 the Hammond company introduced a major improvement to the Hammond typewriter. The shuttle holder was adapted so that two type shuttles could be on the machine at all times. By rotating the shuttle holder 180 degrees, you could switch between type fonts in a matter of seconds. The Hammond Multiplex, as it was called, appeared in a number of versions. Some of the more rare models are on this page. The first of the Multiplexes was in fact a Hammond 12 that was adapted by changing several parts in the turret. Several of these Hammond 12s with multiplex head have survived. Pictures 1 and 4 (left column) show the first of the true Hammond Multiplex typewriters. The curved keyboard machine is almost identical to the Hammond 12, except for the rotating shuttle holder. Very soon, this model was replaced with the so-called 'closed' Multiplex (picture 2). Both the open and the closed Multiplex are rare machines, because they were introduced in a time when the straight keyboard and the qwerty keyboard had become absolute standards for typewriters. The most common model of the Hammond Multiplex therefor is the closed, black model with straight keyboard, which is shown in picture 5. Actually, it is shown here the way it was found after having been stored in a barn on a farm for many decades. Finally, on the right (pics 3 and 6) is another rare Multiplex variation. A small series of this green model was produced during World War I for the U.S. army. One of these green Multiplexes was owned by U.S. president Woodrow Wilson and can still be seen at the White House. See the special feature on James Hammond in the book â€œTypewriterâ€�, page 120.